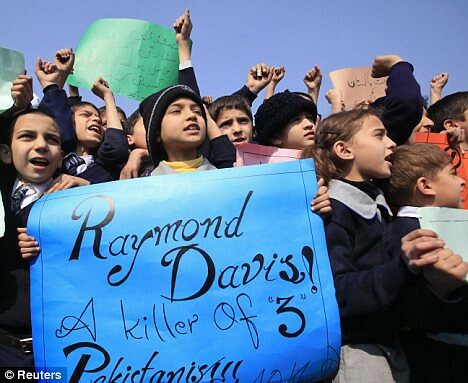 The rejection of the American demand to release Raymond Davis in spite of Obama’s request and special meetings held by John Kerry in Pakistan, is not only shameful for US President but Americans as well. The discussion is going on in this regard in US Senate. Some of the Western Analysts has started criticizing US establishment, they are of the view, “US establishment is responsible for making this problem more complex due to their incapability. In spite of reaching to a mutually acceptable solution Americans had converted this problem into dispute by threatening Pakistan and hasty reactions. This dispute has now become so much complex that USA can neither drop it nor solve it. They gave wrong briefing to Obama and earned shame for him but still they are not ready to get serious and making this problem more grave”. On the other hand according to British Newspaper ECONOMIST, USA has accepted that Raymond was working for CIA. The murder of 2 Pakistanis by Raymond has made Americans a symbol of hatred for Pakistanis. 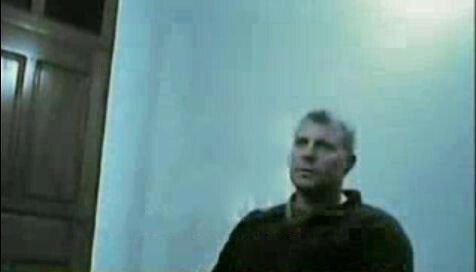 Due to this the guards of Raymond in jail has been unarmed under the risk that they may try to murder him. However Newspaper has expressed its being biased against Pakistan by giving its comments that “the dispute result of mutual disputes between CIA and ISI. ISI is the biggest hurdle in the release of Raymond. As a result ISI has got priority over CIA which is not in the interest of Pakistan”. May be by giving such comments Economist wants to express that Americans and CIA are licensed to kill people, kidnap them, spread terrorism by shooting down innocent people in crowds in the name of safety of US. There should be no one to stop Americans from such terrorist activities. In contrast to this Pakistan govt. and ISI has no right to stop these agents from murdering Pakistani citizens or stop them from harming the integrity of Pakistan. While another Western Newspaper GUARDIAN mentioning the worries of US Officials by the documents that have been retrieved from Raymond by Pakistani security agencies. Pakistani security agencies have came to know by analyzing these documents that external forces are involved in terrorism in Pakistan since long time, all the secret agencies involved in terrorist activities in Pakistan are being supervised and supported by CIA. In such circumstances it has become impossible for Pakistanis to further extend their support to USA for war on terror while Pakistan has been the worst hit in this so called war. The doubts and concerns of Pakistani people are natural after they have been revealed that Raymond and agents of CIA are behind the deadly suicide bomb attacks. 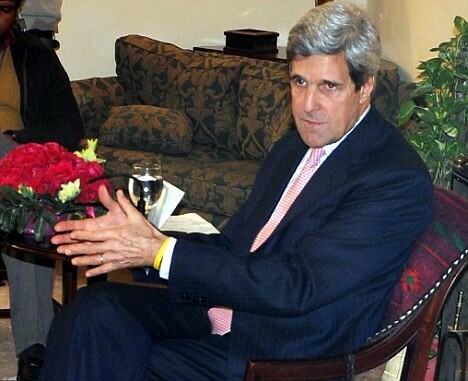 Now it is the test of US officials that what can they do to restore Pakistan’s trust for USA. After such analysis on international level Americans have now stopped threatening Pakistan and are demanding to release Raymond by pleading for forgiveness from the families of murdered persons and paying ransom. Along with this the process of releasing reports in order spread ambiguity about the identity of the murdered persons different media channels have been hired. One is claiming that murdered Faheem and Faizan were robbers trying to rob Raymond, while other claims that they are agents of ISI, the third opinion is that they were agents of Raymond himself who had some quarrel with him. But no one is ready to accept this reality that what was the secret which was known by Faheem and Faizan which forced Raymond to shoot them in the crowd? It does not matter whether Raymond is released or hanged to death this is the right of the Pakistanis to know that secret. British newspaper writes, “Both persons shot dead by Raymond were not common people but agents of ISI following him for last 2 hours”. “Both were robbers and were following Raymond to rob him”, this US claim has been rejected by SUNDAY TIMES in the following words, “according to eye witnesses and shooting the murdered persons from behind shows that actual reason of murder is still secret but they were not robbers at all”. ABC NEWS further explains the story of Sunday Times, “ISI had been closely observing Raymond and his activities. In the end of January he has been warned that he should stay away from military installations in Lahore. But Raymond crossed the Red Line and ISI decided keep him under observation. Both of the agents of ISI had taken some snaps of the Raymond as well”. ABC News further raises the question, “what was Raymond doing in underdeveloped and heavily crowded area where office of Jama'at-ud-Da'wah is situated”. On 27th January as soon as the news of the tragic incident were seen over the media, a Police Officer of SP rank claimed in a statement that both murdered persons were robbers who want to rob Raymond and he shot them in self defense. The reason behind this was perhaps the calm and cool behavior of Raymond which shown by Raymond, he remained on the spot of murder and told worried people that these 2 guys wanted to rob him. But after many Traffic police officers and people gathered there he shot down a Traffic Warden Waqas, this agitated the people and Traffic Police officers surrounded him. The eye witnesses told the TV representatives that Raymond fired on the 2 persons riding the motorcycle by aiming them from his car. The man sitting on the motorcycle fell down and this unbalanced the driver of the motorcycle. The driver was also hit by bullets of Raymond but he tried to hide behind a car. Till this Raymond had got out of his car and aimed at him and shot him dead as well. When Raymond saw that the first person was still having some signs of life he fired more bullets at him. Afterwards Raymond made the video of bleeding dead bodies and talked to some one on mobile. 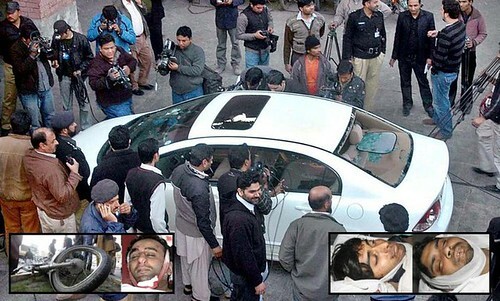 A vehicle came to rescue him from the US consulate breaking the one-way rule and crushed the 3rd innocent Pakistani. The persons in vehicle succeeded in fleeing with a foreigner who was with Raymond on the gun point. On 28th January IG (Inspector General) Punjab told media that the record of all the Police Stations of Lahore has been checked but no case has been found against Faheem and Faizan. But on 29th January police claimed that Faizan was wanted in many cases. Police further told that 2 dacoits Lateef and Rahman has identified as Umar alias Sunny. 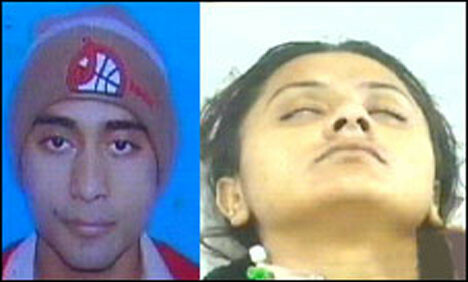 According to Police 2 cases were registered him in Shahdra, 1 in Gulshan Ravi and 1 in Town ship Police Station Lahore. Moreover police claimed that CIA Cantt. 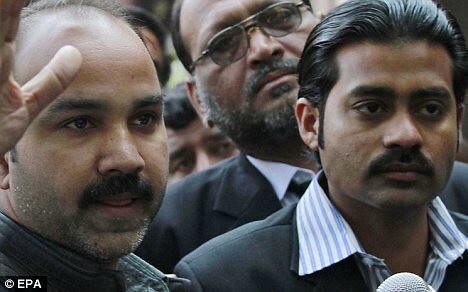 has arrested 5 members of a dacoit gang on 21st July 2010, they have told on investigations that 6th member of their gang is known as Umar nick name Sunny. Afterwards media was told that Lateef and Rahman are neighbors of Faizan who know him very well, right from childhood Faizan was known as Umar nick name sunny in his colony. However when the representatives of media went to the Faizan’s colony in order to verify the claim of Police, the people of colony had known Faizan but the name Umar and nick name Sunny was stranger for them. On the night of 27th January a statement of Dr. Faisal was repeatedly telecasted by TV channels in which he claimed that Faheem and Faizan has snatched mobiles from him and the 2 mobiles found from them belonged to him. However afterwards Dr. Faisal has neither been mentioned nor did he come to front anywhere. Then who were the persons trying to protect Raymond by proving Faheem and Faizan as burglars on the basis of fake claims? Although Lateef and Rahman identified Faizan as Umar but when this strategy failed all of these disappeared from the scene. Is this not necessary that SP Police, Dr. Faisal, Lateef and Rahman should not be investigated that whether they were true or just being used to protect Raymond by USA and supporters of Raymond? Now lets assume that opinion of Western media is true that both Faizan and Faheem were agents of ISI. They were following Raymond Davis for last 2 hours and keeping an eye on him and Raymond has also identified them. Here I would again repeat my question that on what secret mission against Pakistan Raymond was, which was known by these 2 persons and Raymond got afraid that he will be arrested before he arrives his safe place and he decided to shoot them in front of crowd? Because the decision to murder them was not taken as reaction or involuntary action but it was pre planned, if it had not been so, Raymond would have never captured videos of the dying persons. If our hypothesis is correct then there should must be a BACK UP vehicle for Raymond. Then what was in that vehicle, dynamite, suicide bombers jackets, automatic weapons or latest communication system? After shooting the men Raymond stopped just to lend time for the Back Up vehicle to get out of there back to the safe place or US consulate. All these questions can now be answered only by Raymond himself. If we look at the 3rd possibility i.e. Faheem and Faizan both were working for Raymond, met him in a hotel, there they had some quarrel with Raymond and threatened him that they are going to inform Pakistani security agencies about his anti-Pakistan activities. After this Raymond followed them through his car on the crowded roads of Mozang (there cannot be a bigger joke that a person follows through his car while others are on the motorcycle), murdered both of them when he had the chance to do so. Although there are many objections but even if we assume this hypothesis to be true than releasing Raymond will be equivalent to enmity for Pakistan until he does not disclose that on what anti-Pakistan mission was he and how many other traitors like Faizan and Faheem had been bought by Americans? What was the secret which these 2 men wanted to tell to Pakistani security agencies which could have created problems for USA?